Holy cow Mike, that is amazing! 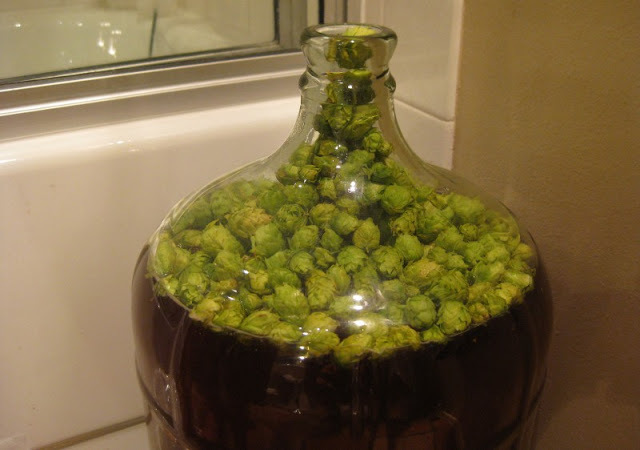 I love the picture of the carboy brimming with hops! Funny you guys should post this, I just had a wet hopped cask pale ale two weeks ago and I'm still thinking about it. I believe the brewer only added the wet hops to the firkin, but the result was simply amazing. I would love to experiment with something like this next year. Once again, I find myself envious of the west coast! Hi Mike - it was fun experimenting with the fresh hops. If you can find a hop source, definitely give it a try. I'd kill to have fresh hops, so cool. As always, your beer recipes look great. Your beer recipes look great! I'm about to brew up some of the Belgian Triple IPA.....really stoked to see how it turns out. Glad you are enjoying the recipes, and good luck with your Belgian IPA! 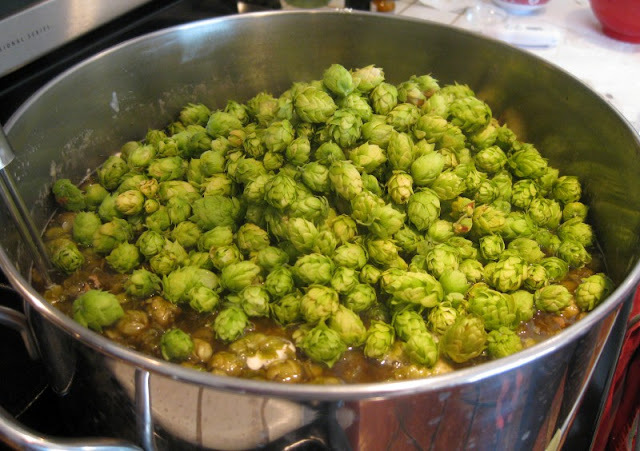 Mike, I have just put 125g of freshly picked hops into an APA my primary fermenter (Day 10). Did your hop flowers sink or did you have to dunk them? I am concerned that the exposed flowers may begin to rot? The hops got saturated and sunk some, but still stayed on top. We didn't have any problem with spoilage, though. Cool, hopefully my hops won't cause a problem either. It will be a nervous couple of weeks waiting for the primary ferment to end. Update on the Harvest Ale - Made it into the bottles with no signs of infection. Still tasted great with no green grass flavours at all. Will report in at first tasting. Thanks for the advice. Glad to hear that your harvest ale turned out well! Amazing! I wondered i could get some of these fresh hops here at Brazil. Unfortunately we only get the pellet ones becouse of shipping costs and condittions... It must be amazing to brew with those, the aroma must be great! ps. 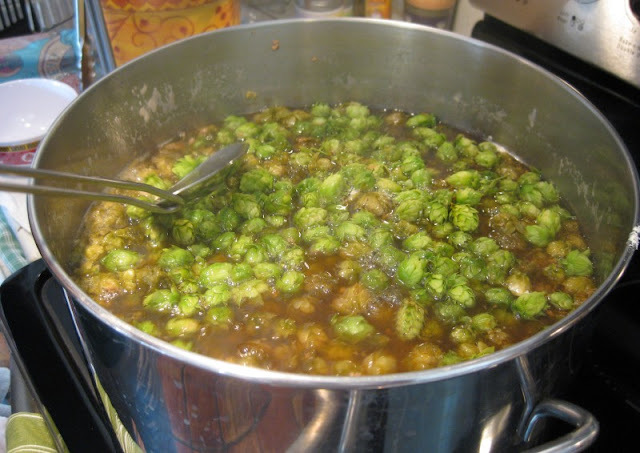 I used one picture of yours at my blog, the one with the dry hopping... is that ok? Thanks! Hi Bruno - sure, you can use that image. I am usually fine with people using our pictures, as long as they ask permission and credit the photo. This is just what I was looking for. (We're planting Nugget and Cascade at the cabin; Thanks for posting it! Glad it was helpful, and good luck with your hops! How old were the plants these hops came from? I am about to harvest my first year Zues, Chinook, and Centennial hops. I'm thinking about using pelletized Columbus hops for bittering though, and then using all the first year hops for late additions. What do you think? Hi Jim - I'm not sure how old the plants were, but I don't think our source had been producing hops for more than a few years. I think using the fresh hops for late/dry hopping is the best way to go - particularly if you don't have very much. Hi there, Thanks for this article! Great information for a novice. Question I have is about cleaning the hops up. I just picked 8.5 pounds (!) Of fresh cascade. I just want to have them ready for my friend who is a master Brewer when we get set to cook. Is there any roasting I can do or anything else fun I can surprise him with if I showed up with a pound of hops like a toasted caramelized something?. We don't have to use it but hey maybe it'll be a brewtime snack! Thanks! 8.5 lbs - nice harvest! Fresh is best. Hops are all about aroma, and the oils that produce the aroma are volatile - the less you do to them the better. So, I have several hop plants growing in my yard- and I'm having difficulty identifying them. I know I have Cascade, and Willamette- maybe Golding or Nugget, or both? Do you think it matters terribly if I mix them up in the process? Will it make that much of a difference? I'm sincerely curious... so I may have to answer this myself by experimenting. Thanks for this recipe- I'm going out to buy ingredients. Even f you don't know which they are, just go ahead and use them - I'm sure it will come out fine. "Wet" or "Fresh" hops refer to hops straight off of the vine (as opposed to dried leaf or pellet hops). 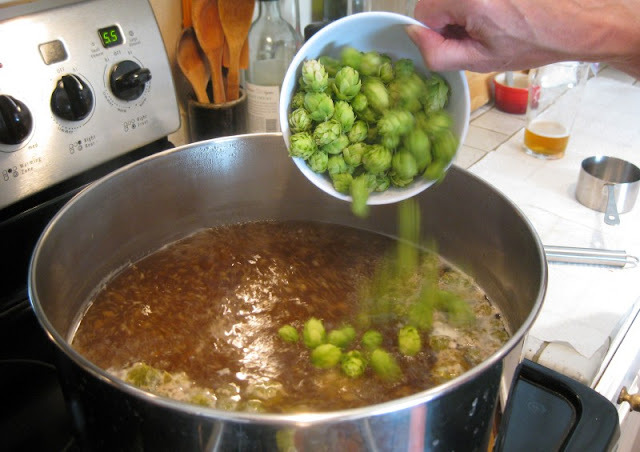 "Dry hopping", however, refers to adding hops (fresh or not) after the boil - usually in secondary fermentation. Hey Mike, quick question about adding the whole cone hops to the secondary. How does this not infect the beer when you dump/cram a ton of raw plant material in your fermenter? Thanks for the best article with recipe out there! Hi Steve - I haven't heard about any particular risk of infection from dry hopping with fresh hops. By the time you add the hops in secondary, fermentation should be mostly complete and I think it is low-risk environment for infection. WOW this turned out so SO SO good i cant wait to see if we will be blessed to make it again next year : ) Not just because we made it does it taste good . THIS IS GREAT beer : ) and a wonderful recipe Thank you for the post. Great - glad to hear it! You wrote that if you did the Cascade/Nugget Wet Hop brew again that you would change the hop schedule. Can you identify specifically what that change might be? Hi Frank, It's been a while since we brewed this one, but I think we'd primarily move some of the hops from the flame-out point to the 60 and 45 minute boil points instead (even better would be to have more fresh hops in general, adding the additional amounts to the front of the boil). Also, we wouldn't wait the 3-7 days after racking to secondary before adding the dry hops - add them right away instead. Question about fresh hops for secondary - how did you store them until it was time to get that secondary fermentor hopped up? Hi Ed, I think we just put them in zip top bags, pressed out the air, and stored them in the fridge. But if you have a vacuum sealer, and big enough bags, that would probably be your best bet (still refrigerate though! ).